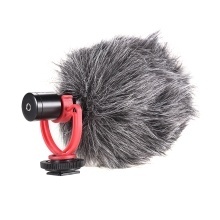 Compatible with smartphone, Tablets, DSLR camera, consumer camcorders, audio recorders, etc. Compact and lightweight cardioid directional condenser microphone. Rugged metal construction. No battery required. The Andoer AD-M2 Microphone Frequency Response: 35-18KHz±3dB; Sensitivity: -42dB±1dB / 0dB=1V/Pa, 1kHz; Signal to Noise Ratio: 74dB SPL. Professional furry windshield and shock-absorbing carrying bag are included. The included anti-shock mount can effectively reduce unwanted vabration, cable and handling noise. Also comes with 3.5mm TRS output cable (for DSLR Cameras, Camcorders, Recorders) and 3.5mm TRRS output cable (for Smartphones, Tablets, and Mac).